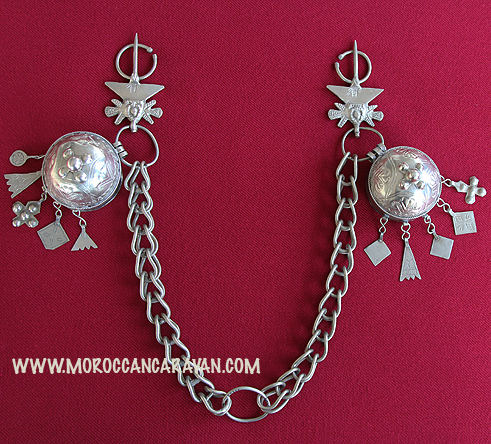 This spectacular fibulae set would be part of the bride’s costume among Imazighen (Berber) in the Draa Valley, Southeastern Morocco. The two fibulas or brooches on top would be used to fasten the garments in front the shoulders on the chest, the two round objects seen on the left and on the right next the two fibulas are containers that can be opened and closed. These two containers would hold traditional perfumes that are released slowly through the joints. Of course the fibulae set is connected with the thick chain to secure and accent the set.